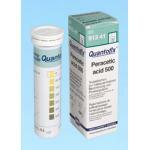 Quantofix Peroxide - Water Analysis Test Strips This Quantofix test strip is ideal to test levels of peroxide/hydrogen peroxide in solutions. 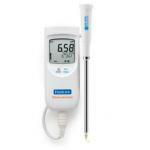 The easy dip-and-read procedure provides reliable results within 15 seconds. This peroxide test strip is used for many different applications. For example, in chemical laboratories, Quantofix Peroxide 100 test strips are used to check organic solvents, because peroxide containing solvents may explode when heated. Moisten the test pad with the solvent and allow it to dry. After drying, add a drop of distilled water to the test pad. If the test pad remains white, the solvent is free of peroxides and can be used safely. Additionally, the test strips are often used to test for residual peroxide in cleaning procedures where high potency disinfectants are employed, e.g. in the dairy industry. Additionally, Quantofix Peroxide 100 test strips are CE marked and are therefore especially suitable to be used in the healthcare environment such as hospitals, doctors offices, etc. Since the test strips can be stored at room temperature, testing with Quantofix Peroxide 100 becomes especially convenient. 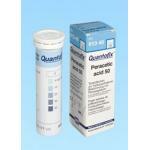 Quantofix Peroxide 100 test strips are the ideal tool to test for peroxide in solutions detecting peroxide in the range of 1 - 100 ppm H2O2.